Sgraffito is the art of scratching through to a layer below. Potters and ceramic artists utilize the technique, as well as enamelists. 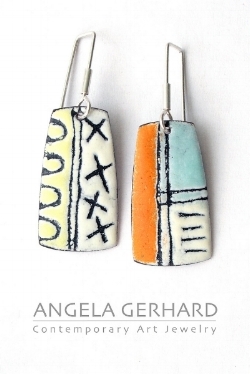 I learned the technique from Angela Gerhard several years ago, using liquid porcelain enamel. Scratching through liquid porcelain enamel is delicate business. If it's too wet, you get little squiggles that roll up and are difficult to irradicate. If you let it dry too much, when your lines cross, large chunks can flake off. So, creating fine textures are difficult. I recently learned of a technique that was developed by John Kilmaster. It's called granular spray enamel. It is very exciting to have a new way to create design and texture in a free an exacting manner. 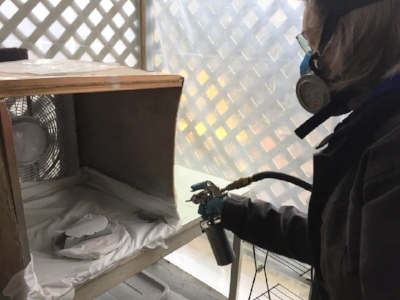 In the picture below, you can see me spraying a steel mask that I fabricated in a class I took from Alisa Looney, a student of John's. Here are some process pics of one of the test pieces I made in Alisa's class. We taped the steel tiles to cardboard to make it easier to work on. The last photo is of the piece after it was fired. It was slightly underfired, so there is a lovely, bumpy texture to it. I went to Alisa's class planning to make jewelry. We spent three days making test tiles and fabricated one large piece. We made a few token pairs of earrings. I had to come up with designs on the fly - flying by the seat of my pants - ha, ha. Knowing that I am going to be exhibiting a collection based on The Day of The Dead at Whidbey Art Gallery in October, I decided to create a sugar skull. However, my sugar skull somehow turned into a more life-like skull. The ease of creating lines with the sprayed on enamel was so freeing! I really enjoyed creating fine detail and shading with cross hatching. The photo above left is pre-firing. The middle photo is just after the skull came out of the kiln. In the third photo, I'm applying watercolor enamel to the skull to add more shading and visual interest. Here, you can see the little scratching tool we made in the class. I'm using it to remove some of the watercolor enamel before I complete the final firing. 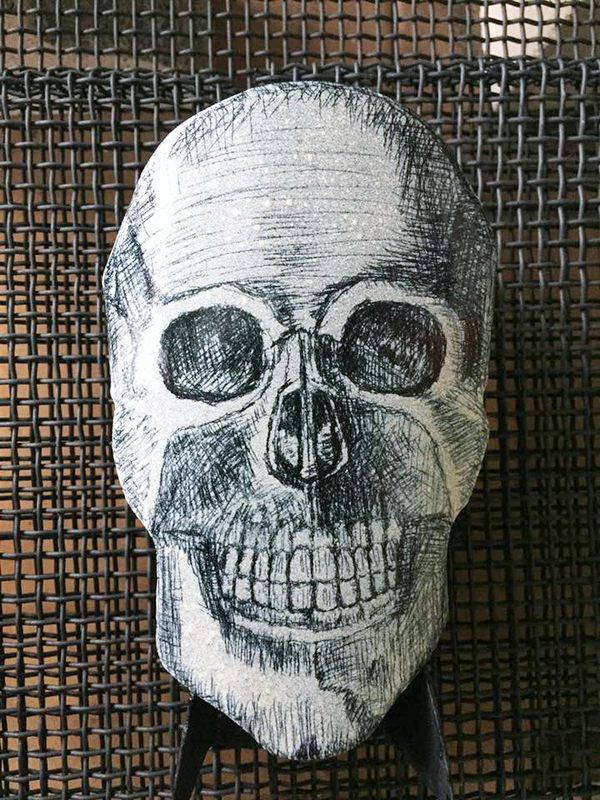 This is the skull after the final firing. I'm pretty excited about how it came out. Now, I have to figure out how to do this process at my studio. It's messy - not something you can do inside. I have the spray gun, but I don't have a compressor yet. So, I'm still doing sgraffito the way I learned from Angela. Here's a little video of how it's done. If you are interested in learning how to do sgraffito in porcelain enamel, you should check out my Beginning Sgraffito Enamel Technique Tutorial.